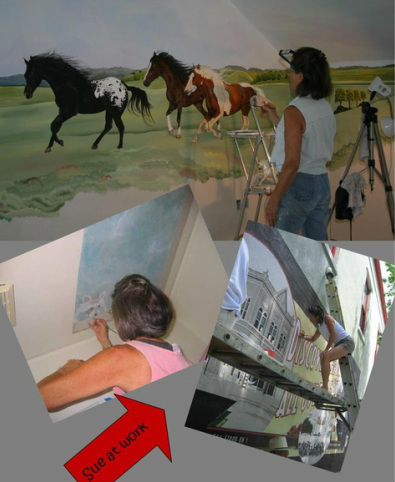 Self taught, Sue Hains began paiinting at the age of 7 with a gift of paints from her Grandfather. Inspired by surfaces and forms she observes in nature (she received her BA in Natural History from the University of Colorado, graduating with Distinction) Sue creates illusions of stone, animals, and plant life which range from the highly stylized to photo-realism. Sue strives for perfection and does not stop 'til both she and the client are perfectly satisfied. In 2012, after painting the commissioned image of an FBI dog killed in action, Sue took on the Hero Animal Mission: painting the portraits of Military Working Dogs, Service Dogs and other animals who have saved a human life and then donating the portrait to the animal's companion.